If you find yourself constantly modifying plugins and style sheets, you might want to make the process of navigating from the homepage to the options page a bit faster. You can easily add shortcuts to the admin bar by adding this code in your functions.php file. 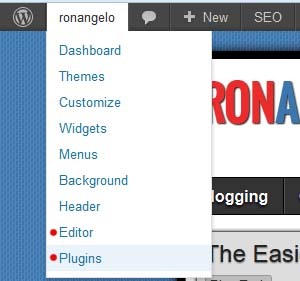 Using the code above adds two additional menu items, shortcuts to the Plugins page and the Editor page. You can follow the format and add additional shortcuts of your choice. Change the value of href to your desired address.